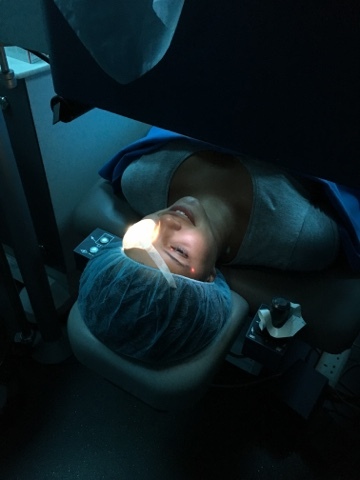 My LASIK Experience, Every Detail! 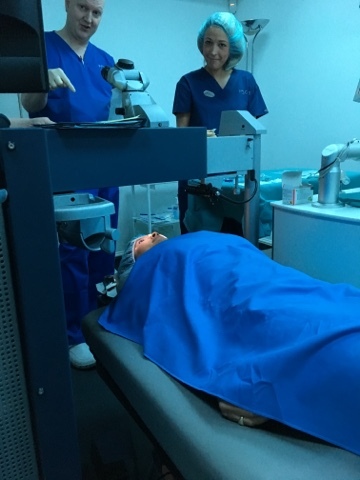 Alright, ever since I posted about getting LASIK eye surgery this week I've had tons of questions from so many friends and family that are considering having it done so I thought I'd just write a whole blog post about my experience to kinda help everyone out. I've needed glasses since I was 13 for my nearsightedness and was told I may be eligible for LASIK when I was about 28 and after a quick thought I chickened out at the thought of my eye being sliced into. Now, my much braver 31 year old self is soooo happy with my decision to just go for it! I was so tired of always lugging my glasses around and hoping I don't lose them for the 4th time while I'm out or traveling. I also started getting worried about getting lines around my eyes from squinting all the damn time. See, I was never really able to wear contacts since they always bothered my eyes because of my astigmatism. Ok let's get down to all the info! 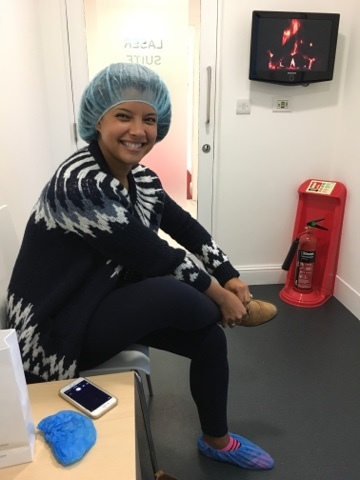 I chose my LASIK clinic after reading loads of reviews and looking at almost every website for every practice in central London. The one I went with was called Focus and had a 100% guarantee plus so many great reviews. They were slightly pricier but I highly recommend not getting LASIK on the cheap. I mean, come on, it's your eyes after all, kinda the most important of the five senses. To be exact mine cost $5270 (£4200) but prices very depending on your prescription. I know, yikes, but to be fair that includes multiple checkups for the entire year after, all medicines and free adjustment surgery if my vision starts to regress again which is rare. I also had a free consultation to start with which was the most thorough eye exam I've ever received! 1.) 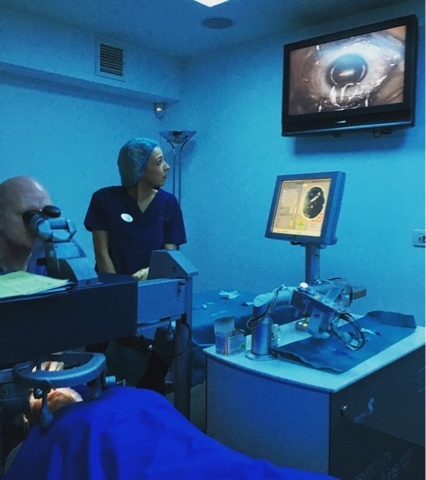 I had my initial consultation where I had my eyes intensely looked at and tested through about 5 different machines. They measured all parts of my eyeball and checked for any deformities or illness as well as the usual vision testing. Then an optometrist explained every bit of the procedure and answered all my questions, including the one she gets from everyone," Is there a chance I'll go blind??" The answer is absolutely no. It is a very careful surgery done with lasers only and nowadays the equipment is extremely advanced to where there are no mistakes. Also, my doctor has over 15 years experience performing LASIK and a perfect track record. Keep in mind I can only vouch this for the clinic I went to, hopefully you choose a clinic with similar standards and the most current equipment. Ps, DO NOT go for anyone still using a blade. It's way outdated yo! And please, don't be afraid to ask even the silliest questions. You will feel much better knowing. So, I made my appointment for surgery for the following month and they gave me a folder full of ALL the info I would ever need about the whole process. 2.) A few days before surgery I had a pre-op appointment to meet my surgeon, Dr. David Allamby. He took another close up look at my eyes and we chatted for a bit while he looked through all the exams I had the month before. He said all was good and ready to go! I asked him if I could have a pill to take the day of surgery to keep me relaxed which he gladly prescribed. 3.) January 25th, 2017, surgery day! I was scheduled for 1:30pm so my husband and I had a nice big lunch then walked over to the clinic. They examined my eyes one last time for good measure then I took my Diazepam 30 minutes before go time. Dr. Allamby's assistant gave me a five minute run down of all the drops and eye care to be done for the first week post su.just before heading into the "Laser Suite". Luckily Dr. Allamby was super cool and even let my husband Steve in to watch the surgery the whole time. I got my hair and shoe covers on then lay on the surgery bed. They gave me stress balls to hold onto which helped incredibly. 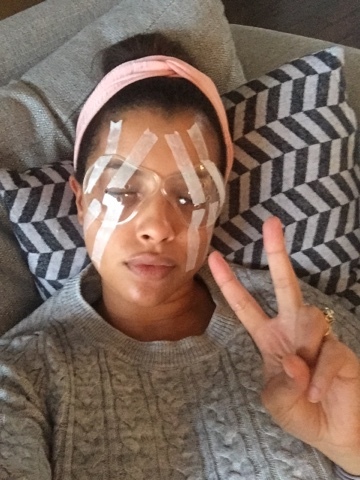 The doctor dropped the very strong anaesthetic (they work immediately) into my right eye then taped on eyelid holders and place some kind of soft clamp around my eyelids which felt weird but didn't hurt at all. In fact it feels like you're actually blinking when you try to but you're not at all so there's no need to worry about interrupting the lasers. I was told to focus on the green laser light ahead of me (there were also fuzzy red lasers all around the green laser) as a round eye piece from the machine slowly came down onto my eye. Then the green laser light went from sharp to blurred then everything faded to black for a few seconds, I just took a deep breath and squeezed away at the stress balls as they counted down from 15 which is how long it took for the first laser to cut a flap into my cornea. It feels like looking through a telescope at a red and green laser show and pushing your eye into the eye piece a little firmer than you normally would. Once the 15 second countdown is finished the red and green lasers come back into view but are very blurry. I could see a clear blob being pushed around and then it was time for the finishing laser. I had to focus on the green laser again and this time only for about 5 seconds. Once that was done I could fuzzily see the doctor sliding the flap back over then gently painting something clear over it and Voila! Finished with the right eye in under 5 minutes! It was the same exact deal on the left eye then I got up from the bed and walked over to the recovery room to rest my eyes for 20 minutes. Amazingly I could see near perfectly immediately after surgery other than a slight haze. After 20 minutes I was ok to leave but was ordered to lay down and rest my eyes for the following 4 hours at home. 4.) Once at home I just laid on the couch listening to music and sleeping on and off. I'm not gonna lie, those few hours after surgery are probably the worst bit of the whole process. It's just uncomfortable and there's a lot of getting used to, like being extremely careful around your eyes which you'll be super aware of. My eyes felt gritty like I had dust in them which is a feeling I was warned about so it didn't worry me. Then on top of that you have to start you eye medication routine which feels like a lot at first (there are 3 different drops that need to go in at different times!) but you get used to it by the next day. Luckily my doctor also sent me home with anaesthetic drops to use on during those rough few hours. Bedtime is a bit of a laugh as well....you have to wear the most ridiculous eye protectors for the first week! I know they look cray cray but they're actually alright to sleep in and are MANDATORY and essential so push your pride aside. 5.) After 3 days I am feeling pretty good now. I wear my sunglasses outside religiously and even bought a pair of large fake glasses to protect my eyes if I'm out after dark. I find they also keep my eyes from drying out. Oh yeah, you might experience dry eye for a little while after surgery because the nerves in your cornea that signal for tears are affected and don't work till they've healed properly. Now all I have to do is help my eyes heal and stay safe from anything that might damage them for the next month or so. No swimming, dusty environments, eye rubbing or balls flying at my face (Clueless reference, haha). Well, I hope this gives you as much info as you need but feel free to drop me any questions. After my experience I would absolutely recommend getting LASIK If you've been pondering it for a while. You won't regret it, I promise.